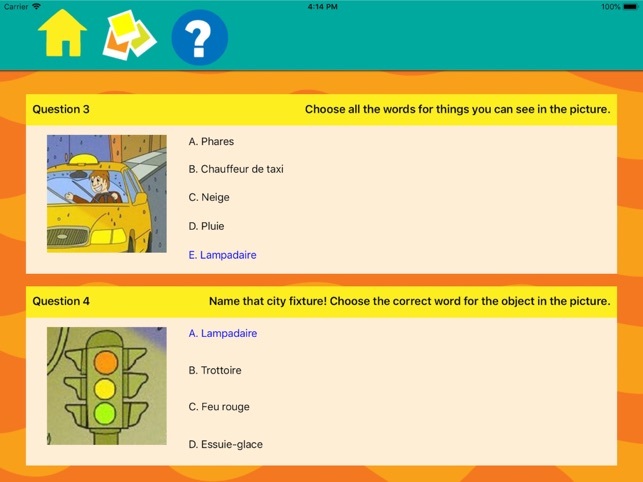 Experience “Picture-Perfect Language Learning” with Noyo French: a powerful iPad vocabulary builder for beginning French learners! -Check your stats--including how words learned, the time spent learning, and assessment scores--and email them to yourself or your teacher! Noyo offers you a quick and easy way to boost your French vocabulary at an incredible value. Our interactive platform helps you learn--and remember!--words by linking them to entertaining images, high-quality audio, and built-in assessment units. At the same time, engaging scenarios and comical characters transform vocabulary building from a tedious chore to laugh-out-loud fun! Educators know that vocabulary acquisition is a necessary step in the process of learning a new language. Too often this becomes a rote and tedious chore, eating up precious class time and losing students’ interest along the way. Noyo’s “Picture-Perfect Language Learning” platform makes this step fun and engaging and boosts students’ ability to pick up and remember new vocabulary by linking words and phrases to appealing illustrations and high-quality audio. Familiar settings, friendly characters, and laugh-out-loud scenarios take vocabulary building from alienating to accessible. Noyo also encourages interactive learning and integration into existing curricula by allowing students to work individually or in groups and then email stats--including time spent on the app and assessment scores--to their teacher. 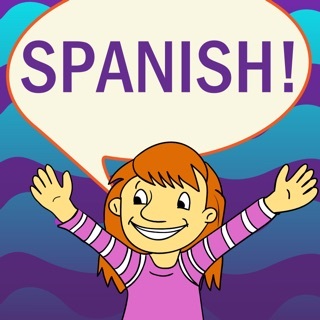 Noyo can be used as a supplemental tool in the classroom or at home, as part of a school curriculum or independently, and by language learners of all ages. Noyo is easy to use. 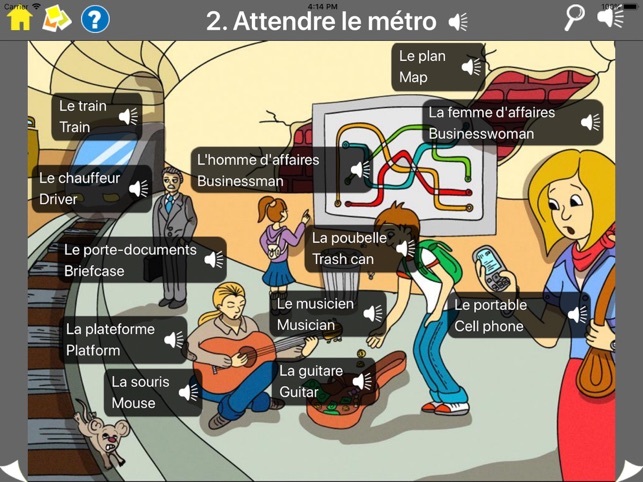 Just tap an item within a scene to hear the French pronunciation and view a written translation of the word or phrase! When you’re finished exploring all the items in the scene, slide your finger across your tablet’s screen to access the next scene in the unit. At the end of each unit, track your vocabulary-learning progress by answering built-in assessment questions, then check out your stats by touching on the tropy. 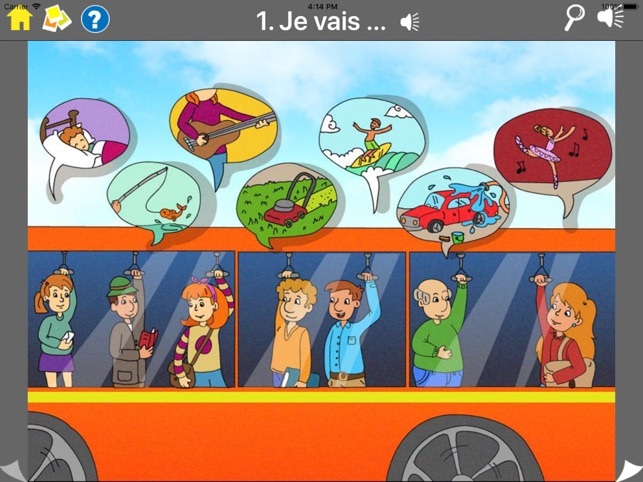 Noyo is the perfect app for beginners of all ages looking to rapidly increase their French vocabulary!